If you don't understand what a Classical Education is, please see here. Religion - God’s Word is the heart of our curriculum. A survey of the entire Bible is completed in the grammar stage. In addition, we memorize many Bible passages and Luther’s Small Catechism. Our Bible program is designed to develop three things: Bible literacy, knowledge of church history, and a strong faith and Christian consciousness. Language Arts (Reading, Literature, Spelling, Grammar, Handwriting, and Composition) - The objective of the program is to help all children learn to speak precisely, spell accurately, write proficiently, and read fluently with comprehension. Literature and Poetry - Literature and poetry are among the central subjects in a classical education. Why? Because, along with history, literature and poetry are the chief ways that we pass on the ideals and values of traditional Western Christian culture. Not only will your child’s affections be trained to love the good (and hate the bad) through characters they encounter in great literature, but they will get a glimpse into the wonder of reality that only good poetry can reveal to us. Mathematics – Memoria Press’ mathematics program is based on mastery learning based on memorization and repeated practice in the lower grades. Students must overlearn basic math skills in middle school in order to be successful in the more conceptual high school math. Classical Studies - Classical Studies is the natural companion to Latin. In classical studies, students study Greek mythology and Greek and Roman history and literature every year, gradually deepening their knowledge and understanding. This long grounding prepares students to read the classics of Greek, Roman, and English literature, and to study and understand the modern world. American and Modern Studies – Students also need to know the history of their own country, place, and people. Memoria Press has gone back and resurrected the history books that taught a whole generation of Americans to love their nation’s history. Geography - A thorough study of the continents where the goal is to connect geography with the history, culture, and economy of the land. This includes mapping skills, continents, oceans, states, and countries learned through a variety of activities. Science - Before you can study nature, you have to know what nature is. Memoria Press’ science program has two goals prior to high school science. First, we introduce students to the world of nature by studying the things it is made up of—birds, insects, trees, mammals, and the heavenly bodies. Second, students are given a narrative account of the development of the sciences—they are given science in a story form, in a way they can best understand it. They are then ready to study high school science using the excellent Novare Science Series. Latin - Memoria Press’ award-winning Latin programs are designed to teach your student to master the Latin grammar through an easy to use, step-by-step process that brings out the logical and systematic nature of this language, the mother tongue of Western civilization. In studying Latin, your student will gain an academic vocabulary, a mastery of English grammar, and will develop the critical thinking skills that come from the study of a complex, inflected grammar. Music and Art - Music and Art - In order to fully understand our Western cultural heritage, we have to see it embodied in the art and music that helped to make it great. Memoria Press’ art program begins in the early grades, where students are familiarized with great Western art and music in simple lessons and continue in middle and high school with more in depth study of our great heritage of art and music, including the great tradition of Latin music. Physical Education - The ancient ideal of “a sound mind in a sound body” is rooted in the view that the truly educated person has learned to manage his life physically, mentally, and morally. Therefore, basic physical education is taught in all grades. Library - The purpose of the Our Savior Lutheran School Library is to support the school curriculum. Our goal is to encourage students to read fine literature and teach basic library skills. 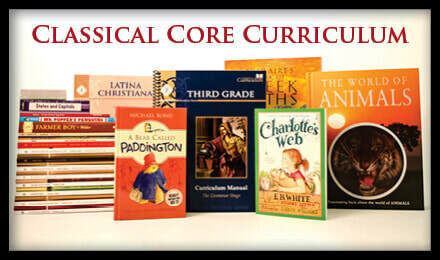 For more information on our curriculum you can visit Memoria Press's website here.